Mary’s second marriage held all of Europe enthralled. Many European countries had a political interest in the man Mary would walk down the aisle with. No country more than England and its queen, Elizabeth I and her most trusted advisor, Sir William Cecil. Elizabeth even offered her favorite, Robert Dudley, the Earl of Leicester. But Mary refused her cousin’s rumored lover. But Mary did marry an Englishman. The Englishman that Elizabeth and Cecil didn’t want her to bind herself to. Her second husband was Henry Stuart known as Lord Darnley, his courtesy title from his Scottish father, the Earl of Lennox. Now this is a crazy intersecting blood line. So here we go: Lord Darnley’s mother was Lady Margaret Douglas. Her mother was Margaret Tudor who was Henry VIII sister. Mother Margaret (let’s call her to distinguish her from her daughter) had married the King of Scotland James IV (Mary, Queen of Scots grandfather) who died. Mother Margaret then married the Earl of Angus, Margaret’s father. Lady Margaret Douglas had a claim to the English throne as the granddaughter of Henry VII and as niece of Henry VIII. Both Margarets ended up in England and Henry VIII’s court because of some very crazy Scottish in-fighting (too long and soap opera-esque to explain here). Now Lord Darnley’s father was the Scottish lord, Matthew Stuart, the 4th Earl of Lennox. His estates were located near Glasgow. He fled Scotland in 1534 then married Margaret Douglas. Both mother and father had grand plans for their son and that plan was to wear a crown and the Scottish crown would do nicely. Lord Darnley was the second of eight children (the eldest had died). He was born in December of 1545 or 1546. He was reared a Roman Catholic but would follow any religion if it gained him what he wanted. Darnley was considered handsome even being described as “most handsome”. He stood between 6’1 to 6’3 so he was taller than Mary’s 5’10 to 5’11. He had a slim, strong and athletic physique that was desirable. He had fair, close-cropped curly hair. Darnley was the perfect courtier. He played instruments like the lute, played games and danced. Yet, this boy had his faults. He was spoiled, immature, and a drunk. In 1565, Darnley was presented to Mary at Wemyss Castle then they parted ways. But they were soon reunited. Darnley charmed all the Scottish lords whose support he needed to marry Mary. He attended church with Lord James Stewart, a Protestant, as well as Mary. As stated before, anything to get the crown. During this time, Mary’s talks with Elizabeth to be named as her heir fell apart. This was Darnley’s chance to gain Mary’s hand and Mary’s chance to get back at Elizabeth. In April of that year, Darnley fell ill and Mary rushed to his side and cared for him herself. After that, Mary lavished him with gifts. She decided to wed Lord Henry Darnley. She believed herself in love but it was most certainly infatuation. As an English subject, he was required to gain Elizabeth’s consent. She did not give it but that didn’t stop the marriage from occurring. 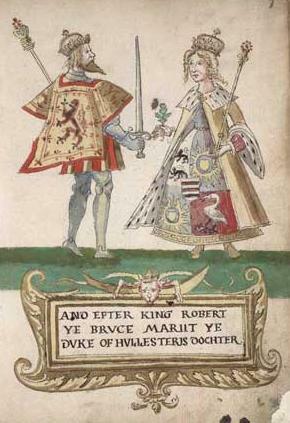 Lord James Stewart, now Earl of Moray, was against this union and refused to sign a document in support of the marriage. This is the start when Lord James turned against his half-sister. Yet, the wedding date was set for July 29, 1565. The day before, Mary proclaimed Darnley King of Scots. In August, Lord James and some other lords rebelled. It is called The Chaseabout Raid. This rebellion got its name because both sides just rode about, chasing (in Mary’s case) and fleeing (Lord James’ case). It ended because Lord James fled to England. As Mary was at the height of her reign, her marriage was at its lowest. Darnley was a drunk. He spent his time carousing in taverns and brothels. Worse, the so-called King believed the hype (when he was king in name only). Meanwhile, Mary began spending time with Rizzio, her Italian secretary. Naturally this sparked talk of an affair between the queen and the upstart who came to Mary’s court as a musician and rose to secretary and close confidant of the queen. People have said that she was foolish to do this but Henry VIII liked to appoint “lower classes” to high positions because they would know where their lives hung. After all Cromwell and Worsley were sons of a blacksmith and a butcher. Now, this royal couple lived very separate lives. During this time, a conspiracy began with Darnley being played by the lords. It is believed that this started so the rebel lords could return to Scotland. The Earl of Ruthven played a part along with the Earl of Morton, the Earl of Lennox and other Scottish nobles along with Sir William Cecil. It was decided that Rizzio had to die and the now pregnant queen must be detained until her child was born and Darnley given the Crown Matrimonal (which would have made him King of Scotland). The plan to murder Rizzio happened as Darnley wished. In March 1566, the pregnant Mary hosted a few close courtiers for supper in her closet (a small room). During the night, Darnley made an appearance, playing the charming husband, when Lord Ruthven burst in, demanding Rizzio be handed over to him. Rizzio cowered behind the queen. The other conspirators rushed in to the small room that could hold a dozen and was now crammed with at least thirty people. The men grabbed at Rizzio. Mary was thrown into Darnley’s arms and he was told to take his wife away. Darnley pulled Mary from the closet into the large space and Rizzio chased after her. Just then the men attacked, stabbing Rizzio. He cried out and clutched at the queen’s skirts as they stabbed him. Darnley bent back his fingers and the assassins dragged Rizzio away. The next day, Darnley went to the queen in terror and begging her forgiveness. He swore that Rizzio’s murder was not his plan. She demanded Darnley reveal all and he did. He told of the plan to imprison her in Stirling Castle until she died. Mary can up with a plan. Together, the royal couple escaped through the back stairs and through the wine cellar. They had to make their way through the cemetery and there two men waited with four horses. Mary heavily pregnant mounted her horse and rode away to Seton Castle then onto Dunbar Castle. After five hours in the saddle, Mary arrived safely.